In preparing for the end of the world as we know it, most of us envision facing that future with our families. But what if something were to happen to you? Even if there is no widespread disaster, your death or the death of a spouse or other family member can be the end of your family’s world as you know it. Don’t think you’re too young or fit for something to happen to you. And please don’t brush off these important preparations because they are tedious or not as glamorous as stocking weapons and ammunition or a year’s supply of toilet paper. Nobody is invincible and accidents happen leaving families to move on without a family member who has died. 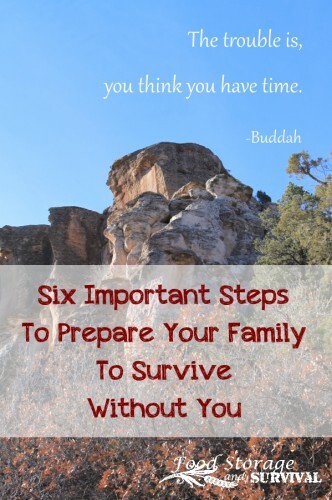 So even though it is uncomfortable to think about, here are six important steps to take to prepare your family to survive without you. If you are the wage earner for your family and your income suddenly stops, how are your spouse and children going to pay for their necessary expenses? How will they make the house payment, pay for car repairs, food, clothes, utilities? If your job provides the health insurance, how will they replace that? Even a small life insurance policy can give your family a financial buffer, allowing them time to make good decisions for their future. If you are not the primary wage earner, your spouse will still have extra expenses without you there like paying for childcare while they are at work. Plus you have the expenses involved with the funeral itself. Help secure your family’s financial future by getting life insurance on yourself and your spouse. It may seem like an unnecessary extra expense, but it is a crucial step in getting your family started in their new life if you die. Here is an interesting article about what kind of life insurance is the best investment. And an online life insurance calculator to help you figure out how much you want to get. Your insurance agent can also help you determine what you need. You may think you don’t need a will. Everything that is yours will just go to your spouse, right? Well, not exactly. It can get complicated. Your jointly owned assets will pass directly to your spouse, but without a will, your personal assets may be divided between your spouse and children and it can get even more complicated if you live in a state that requires a trustee to keep the children’s portion if they are minors and that trustee cannot be the surviving spouse. So your spouse can end up with a lot less than you thought with someone else watching over the rest until your children are grown. A will is even more important if you have minor children in the event that both parents die. Then your will and not the state will decide who will finish raising your children. Be sure to list the same person as guardian of your children and as secondary beneficiary of your life insurance, ensuring the money will be used for the support of your children. Talk to a lawyer, write a handwritten will (legal in most states), or purchase a will kit like Quicken’s WillMaker Plus to get your will written. Your will, life insurance policy, and other important information should be kept in a location that is secure and known to your spouse, parents, and responsible children so they will know what you have and where to find it if you die unexpectedly. Many people use a safe deposit box at a bank for these documents. Here is an option for keeping them at home. Can your spouse access your bank account? Your online profiles? Your phone or other electronic devices? There may be some important information they need to access or they may just want to be able to see your photos. Keep a list of your passwords where they can find it. 4. Share Your Preparedness Gear and Plans. Do your spouse or children know where the food storage is? Do they know what tools you have and how to use them? Are you caching gear in locations other than your home? If your spouse is not supportive of your preparedness efforts, be sure someone close to you knows what you have and what it is for so it doesn’t end up being left behind or sold in an estate sale when you’re gone. This is one you want to be doing anyway in order for your children to be able to provide for themselves when they leave the house. Can they cook a meal, wash laundry, keep a house clean, hunt, budget, build something, change a tire? Can your spouse perform the responsibilities you normally do in the home? Helping your spouse and children learn the skills they need to be able to take care of themselves is important even if you don’t die. 6. Provide Opportunity for Education. Allow your spouse and older children the opportunity to learn job skills that will make them employable in the event that you are no longer around to provide an income for your family. Support them in job training or side work they may want to do. The corollary is that if you are not the primary wage earner, work to have enough education and skills that you are able to earn an income if your spouse dies. You never know when your time is up on this earth. It does not matter if you are only 25 years old and still believe you are invincible, taking these steps to prepare your family to survive without you can be one of the most important preparedness efforts you make.